As a beauty blogger, I don't really need an excuse to try new things; it's in my nature, no matter how much I like a cleanser or shampoo, I'm always going to want to try something new. 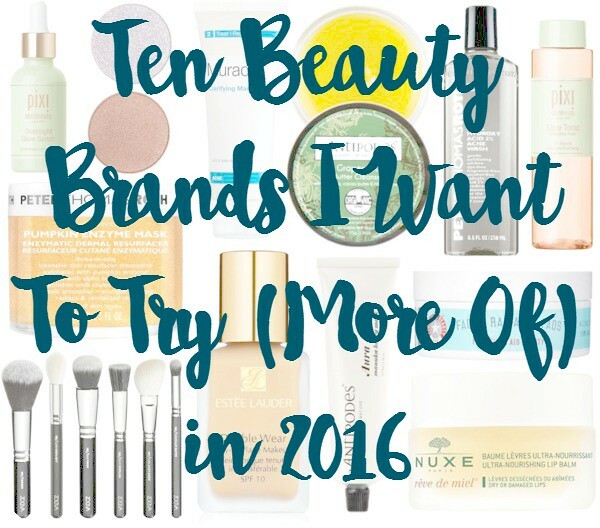 With that in mind, I'm setting myself a target of ten brands I'd like to try out in the coming year - some of these will be totally new to me, and others are brands I've tried a product or two from in the past, and want to expand my horizons, so to speak! Antipodes | Another brand which have seemed to be everywhere in recent months, giving me another handful of products I'm lusting over; from their Aura Manuka Honey Mask which claims to cleanse and hydrate in one, to the Divine Face Oil which apparently increases Collagen production by up to 51%, reducing lines, scarring and age spots. I also really like the sound of the Grapeseed Butter Cleanser and the Vanilla Pod Hydrating Day Cream. Estée Lauder | I've never tried anything from Estée Lauder but I've been meaning to try their cult favourite Double Wear Foundation for about four years now - hopefully 2016 will be the year I finally get round to that! I'm torn between the original formula and the Double Wear Light, which offers SPF10 and claims to control oil with a lighter formulation. I'll have to get shade-matched in each and see which I prefer, I think! First Aid Beauty | I really love the idea of acids in my skincare routine and am hoping to incorporate more of them this year, in an effort to see what they can do for me! First Aid Beauty's Facial Radiance Pads seem to be quite popular. I'm also really interested in their Facial Radiance Overnight Mask, which claims to work overnight to provide hydration and luminosity - my skin can get horribly dull so this sounds perfect for me. Makeup Geek | Makeup Geek have sort of been on the edge of my radar for a few months now but after seeing Jasmine's post a few weeks back, I'm seriously wanting to start building myself a little palette - I love the idea of creating a palette myself, knowing that I love and will use all of the shades in it! In particular, I'm loving the look of 'Day Dreamer' and 'Starry Eyed' from the Foiled line, and 'Cosmopolitan', 'Homecoming', 'Shimma Shimma' and 'Roulette' from the standard eyeshadow line. I've heard less about their blushers but I've definitely got my eye on 'Rendezvous'. Murad | I've recently been trying out a sample of the AHA/BHA Exfoliating Cleanser from Murad which my skin seems to love, so I'm considering purchasing it in the full-size. I also really like the sound of their Clarifying Mask, which will apparently deep cleanse the skin whilst soothing and calming any irritation, whilst the Pomegranate Exfoliating Mask claims to revitalise and rebalance the skin. Nuxe | I have a little bottle of their Huile Prodigiuese which I've used a couple of times and found really nice; I'm keen to try more from Nuxe's range, in particular their Rêve de Miel Lip Balm and their Crème Fraîche Mask. Peter Thomas Roth | After reading about the Pumpkin Enzyme Mask over on A Model Recommends, I'm really keen to try it; Ruth positively raved about it! It offers a three-fold approach to radiance with pumpkin enzymes (hence the name, presumably! ), AHAs and Aluminium Oxide crystals. Apparently it also smells pretty nice. The Beta Hydroxy Acid 2% Acne Wash sounds like something I could really use within my routine; whilst I wouldn't say I suffer from acne per se, my skin is certainly not as good as it could be. Pixi | I tried a sample of Pixi's cult favourite Glow Tonic last year and loved it; I think I got five or six days' use from the little sample bottle I had, and could see a massive difference in my skin just from that. I definitely want to repurchase the full-sized Glow Tonic this year, and I really love the sound of the Glow Mud Cleanser, Glow Mud Mask and Overnight Glow Serum, too; basically anything that sounds like it might give my skin a bit of a glow! Zoeva | Every blogger on the planet seems to have a Zoeva palette and I have to admit, they do look absolutely beautiful, as well as being really affordable and looking like decent quality. I've got my eye on the En Taupe palette which contains a stunning mix of, funnily enough, taupe shades! I really need to upgrade my makeup brushes as I'm using a motley collection I've amassed over the years, and I'm really starting to appreciate the difference good tools can make; the Rose Golden Eye Brush Set & Classic Face Brush set would make a welcome addition to my stash! Are there any new brands you're hoping to try this year? What products would you recommend from the brands I've mentioned? Any other brands I need to add to my list!? So many blogger staples in this post! I've not tried any of them - Aesop always looks pretty tempting to me though. Thank you for the comment you left on my book haul post - that Blake cover is bloody beautiful, isn't it?! The Zoeva brushes seem to be everywhere! I want to try them too because I hear so many nice things about them. The lip balm by Nuxe is the only one I use. It's amazing! I also don't have any ZOEVA makeup palette :)Recently I have tried some of their brushes,they are quite affordable and nice but nothing amazing.I love Nuxe huile prodigieuse and if you have dry/normal skin you should give it a try. As for the Estee Lauder Double Wear Stay in Place foundation,is one of my very favorite Estee Lauder products and foundations but again,if your skin is on the dry side you will not like it. What a great post. I'd love to try more of the Makeup Geek line. I love her and her shadows seem amazing from what I see and read. I've been wanting to try double wear so the longest time. Highly recommend Antipodes - one of my favourite brands! I love both the Divine Face Oil and the Manuka Honey Mask. I found the First Aid Beauty Radiance Pads a tad too gentle and get better results from the Pixi Glow Tonic. Oh and the Nuxe lip balm is worth the hype - it's saving my lips right now! Love these beauty brands!! Great products!! From this list, I'm so interested in MUG eyeshadows. Just trying to check shades I would really love to wear and place order soon.